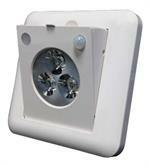 LED motion sensing emergency light fixtures provide a way to get emergency lighting on demand when you need it. 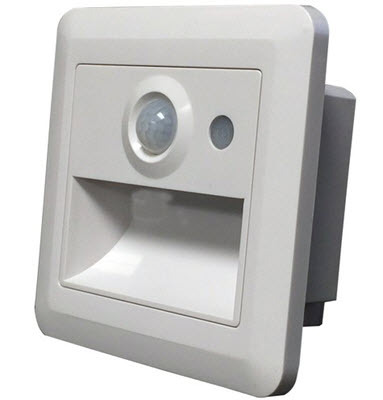 This has a small motion sensor on it so it's going to be able to determine if there's movement in the area and will switch on. By default it will stay on for 15 minutes after it is activated when plugged into AC power. 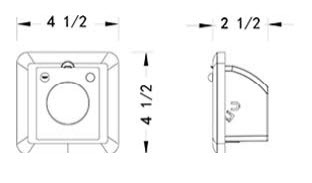 When all AC power is out, then it will function as an emergency light fixture which will come on for 90 minutes providing light for egress and other essential needs. Not only is it a great emergency light, but it's something that can be used almost anywhere because it mounts inside a deep 4 inch junction box making it possible to put it almost anywhere. And because it mounts inside that junction box, it's nearly flush against the wall making it in obtrusive and out-of-the-way. If you have stairs and want to get those lighted at night and yet still have the emergency capability, this would be a good choice for that type of application. But it could be used in many other types of lighting, anywhere you want to have an emergency light that is low cost and is easy to install. It operates on either 120 or 277 volt circuits and has a five-year warranty against any defects in workmanship.